i was quite sure that i already posted this fantastic victoria sponge cake, but couldn’t find it. so maybe my blog archive is badly organized, but anyhow – it is worse posting it twice and i hope you will enjoy this version as much as we did. the biscuit is from nigel slaters’ fruit book and very simple and extremely good. the rest is my adaption based on the things we had at home. 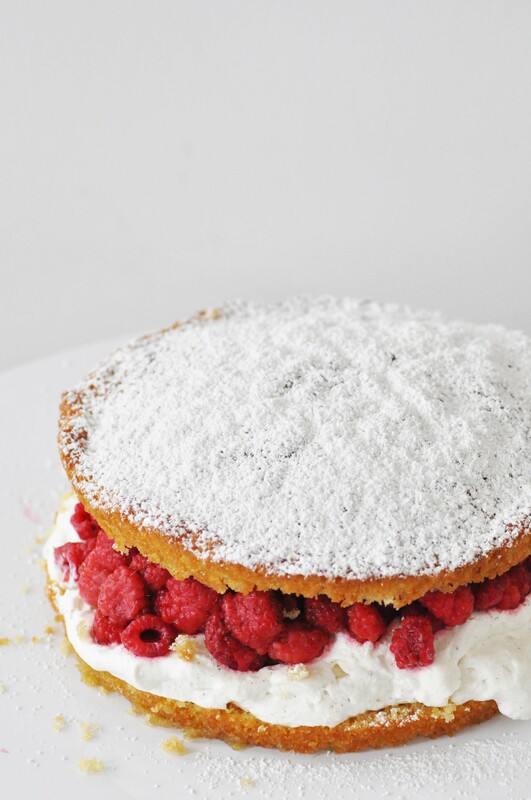 you will need the sponge cake, some whipped creme and fresh raspberries only. that’s it. and it is quick and not complicated at all. so everybody can make this cake! if i remember right, my first victoria sponge recipe was with fresh raspberries and raspberry jam and therefore a bit sweeter than this one. as it only contains fresh raspberries it will have a fresh and light flavor. perfect for warm and sunny afternoons with your family and friends. preheat the oven to 180°C. butter a small round cake tin (about 20 cm or smaller). pour the butter and the sugar in a large mixing bowl and beat until foamy. mix in the two eggs, one each time. strain the flour and the baking soda and add to the mixture. pour the dough into the cake tin and bake for about 20 or 25 minutes. the biscuit will be ready if nothing sticks on a wooden stick if you put in. allow to cool on a cooling rack. then you can halve the biscuit lengthwise. whip the cream while adding the vanilla sugar. place one part of the biscuit on a cake platter, spread the whipped cream and top with the raspberries. set the second part of the biscuit on top and sprinkle with some icing sugar. zuerst den ofen auf 180°C vorheizen. dann eine kleine runde kuchenform (20 cm oder kleiner) mit butter einfetten. butter und zucker in eine große rührschüssel geben und schaumig schlagen. dann die eier nacheinander unterrühren. mehl und backpulver sieben und ebenfalls untermischen. den teig in die kuchenform füllen und 20 bis 25 minuten backen. der kuchen ist fertig, wenn an einem holzspieß kein teig mehr kleben bleibt, wenn man ihn in den kuchen sticht. den biskuit auf einem kuchenbitter auskühlen lassen. anschließend längs halbieren. die sahne schlagen und dabei den vanillezucker einrieseln lassen. eine teil des biskuit auf eine kuchenplatte legen, die geschlagene sahne darauf verteilen, die himbeeren darüber geben und mit der zweiten biskuithälfte bedecken. zum schluss noch mit etwas puder(staub)zucker bestreuen. This entry was posted in recipes, summer and tagged cake, raspberry, sweets by The Cook. Bookmark the permalink.